This new presentation gives you multiple strategies to land bigger and better clients. Cory reveals the secrets he and Ira are using that go above and beyond the norm. You want this. Cory helps you target the BIG FISH and secure larger fees. LinkedIn is the perfect place to apply what Cory teaches in this New Advanced Video Training. Hate to Write? We don't blame you. You'll get 30 days worth of quality, professionally written post to give your LinkedIn profile "juice" and set yourself up as an instant expert! Absolutely critical! 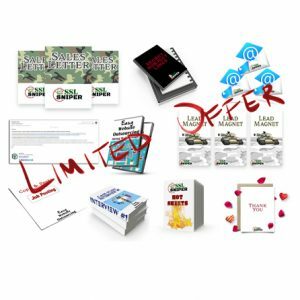 Battle tested PROVEN messages that will help you connect with potential prospects. Why re-invent the wheel when you can grab these response-generating messages and sit back? Build the message momentum! These new messages written by Cory & Ira's team will increase engagement and generate a high rate of response. Saves you mountains of time, too. They're a great way to follow up with prospects you've connected with on LinkedIn. Presents you as a top pro to LinkedIn members. Brochure Bait Pieces! Use as opt-in bait for your autoresponder or use on your website or FB page! Its content that sells. Amateurs starve, Pros Feast! You NEED a professional looking background image on your LinkedIn profile. Use these little gems for your own profile or on clients profiles. "Education Marketing" works! Position Yourself as an Authority on LinkedIn. These can be used for blog posts, social media posts, or website content. ($27 Value) DFY PROVEN HIGH CONVERTING email templates. Don't have time to write? Don't agonize over what to say- don't procrastinate. Use these templates to sell LinkedIn marketing services and put more money in your pocket by the end of the week!